Do not sell me short! 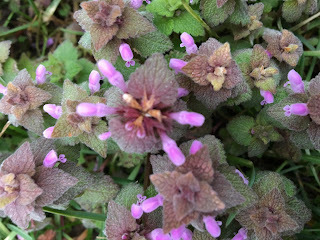 I am Purple Deadnettle, also known as Archangel, known in Deitsch as Daabnessel (which in modern Deitsch literally means "deaf nettle" but "daab" carries a second meaning of "barren" or "dead"; therefore, dead nettle, with the reference being to the lack of the sting), and by the taxonomic name of Lamium purpureum. Although my name says "nettle," I am not related to the amazing plant, Urtica dioica or other "true" nettles. Instead, my squarish stem will serve as a clue about which family I am truly in. I am a mint. 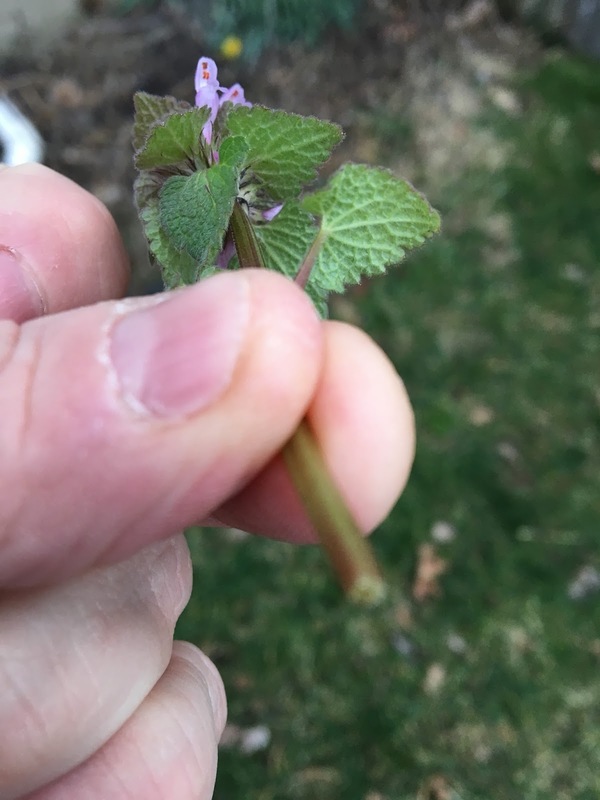 I may not smell as pleasant as Spearmint or Peppermint, but I have some of the same medicinal properties as they do. I am an astringent, a diuretic, and a purgative. I carry within me antioxidants, Vitamin C, and flavonoids such as quercetin. I have been shown to have some effectiveness against e. coli (see your doctor if you suspect this! ), and my essential oil contains Germacrene D, which gives me antimicrobial properties. I may be a little tough to eat in a salad, though people do make use of my generous self. More commonly, though, I am consumed as a tea, often alongside other early spring greens. I flower early in the year, thus providing a food source for mammals and insects. Despite the fact that Germacrene D also has insecticidal properties, other aspects of my being attract some insects as well. I am one of those plants whose seeds have elaiosomes, which ants love to eat. They take my seeds and help to scatter them, thus reminding us of the Zusaagpflicht or sacred duty that exists among plants, animals, and humans. I have some traditional (and not necessarily happy!) lore associated with me among the Deitsch (Pennsylvania Germans or Pennsylvania Dutch). 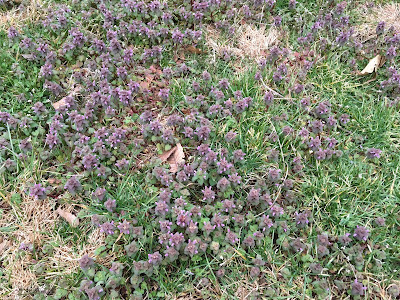 A strong stand of Purple Deadnettle appearing in the Fall is said to divine a mild winter. Also, if someone is very ill, then the urine of that person is to be collected at night and poured onto Purple Deadnettles. If the Deadnettles were yellow or dying the next morning, then the ailing person should be expected to die from the current ailment. If the Purple Deadnettles were still green, then the person would be expected to overcome the ailment. In this day and age, chemical companies tell you that I am nothing but a blight on your lawns and encourage you to poison me. By doing so, you are also poisoning the insects and animals that feed off me and dumping the poison into your soil and your water supply. I know I am persistent and I go to seed before most people even start to mow their grass, but turning the soil will usually cause me to look elsewhere for a home. If the lawn is something that you enjoy, thick turf will often discourage me from moving in to begin with. Disclaimer: This information is for educational and discussion purposes only. Nothing in these posts is intended to constitute, or should be considered, medical advice or to serve as a substitute for the advice of a physician or other qualified health care provider. As always, your health is your responsibility. Consult with a doctor before using any herbal remedy or preventative.